We have been meeting the needs of our clients by manufacturing a wide range of 30/35 litre containers. 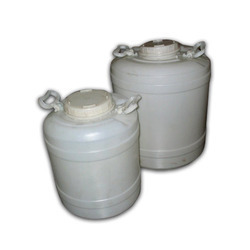 These 30/35 litre containers are fabricated using superior quality raw material and can be customized as per the specifications of our clients. We have successfully positioned ourselves amongst the renowned organizations, engaged in manufacturing and supplying a wide range of Plastic Drums and Containers. Our portfolio consists of Plastic Can With Handle, Plastic Containers, Jerry Cane, Open Top Drum, Plastic Drum Centre Mouth, 5 Litre Containers, Drum and Mauser, Open Top Plastic Drum With Lid, Plastic Can/ Rocket, etc. These are fabricated by our personnel, using high molecular-weight and high-density polyethylene resin plastics that are procured from reliable and trusted vendors of the industry. These are highly acclaimed by the patrons for features like leak proof, strong & rigid, durable finish, easy cleaning. We supply our products all over North India. We have appointed a team of competent and dexterous professionals, which holds in-depth knowledge and immense experience in respective work areas. They keep themselves updated with the changing requirements of the customers and put in all their efforts to supply the products that are at par with the defined industry standards. Further, we also safely store our range in the spacious warehousing unit, which is well connected to roads and other transportation modes. This helps in delivering the products at the respective destinations within set time frame.